Office Templates provides over 500 of ready to use office templates for the Microsoft Office suite including more than 75 Excel templates, 375 Word templates, and 250 PowerPoint templates. 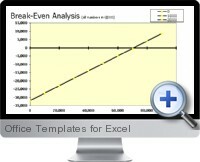 Increase efficiency with templates designed specifically for the business process management and analysis. Business Management - Auto Expense Report; Basic Invoice; Bill Of Lading; Daily Production Report; Daily Time Sheet; Expense Report; Inventory Control; Job Estimate; Project Cost Summary; Purchase Order; Quotation Evaluation; Quotation Record; Request for Quotation; Service Invoice; Shipping Order Statement; Weekly Work Schedule; Yearly Project Progress. Company Finance - Balance Sheet; Break-Even Analysis; Business Acquisition; Business Indebtedness; Cash Budget; Cash Flow Sensitivity; Five Year Projections; Pro-Forma Balance Sheet; Pro-Forma Income Statement; PV Mixed Stream; Start up Budget; Start up Capitalization; Statement of Cash Flows; Weekly Cash Flow. Personal Finance - 401K Planner; 401K Reallocation; Balloon Payment Loan; Basic Bond Valuation; Buy vs Lease Car; Capital Gain and Loss; College Monthly Budget; Extra Payment Analyzer; Financial Calculator; Financial Condition; Future Value Annuity; FV of Retirement Plans; Holiday Budget; Investment Record; Loan Calculators; payback Period; Portfolio Allocation; Present Value Annuity; Present Value Lump Sum; Retirement Budget; Retirement Income Tax; Retirement Plan Contribution; Retirement Plans; Statement of Net Worth; Wealth Accumulation; Year End Tax Plan. Real Estate - 7 Year Balloon Loan; Biweekly Mortgage; Closing Costs; Gain on Sale of a Home; Home Equity Comparison; Home Equity Qualify; Home Improvement Record; Home Mortgage Checklist; Home Rent or Buy; Household Inventory; Mortgage Amortization; Mortgage Qualifications; Mortgage Refinancing. Personal Planning - Appointments; Cash Receipt; Collectibles Inventory; Daily Planner; Fitness Tracker; Grading Sheet; Important Documents; Monthly Calendar - Land; Monthly Calendar - Port; Petty Cash Report; Quarterly Planner; School Budget; Vacation Budget; Vacation Checklist; Vacation Planner; Wedding Budget; Yearly Calendar; Yearly Planner. Sales And Marketing - 24 Month Sales Forecast; Direct Marketing Analysis; Moving Average Forecast; Monthly Sales Projections; Monthly Sales Seasonality; Product Sales Goals; Quarterly Budget Analysis; Quarterly Marketing Budget; Quarterly Sales Record; Sales Channel Analysis; Store-to-Store Sales; Summary of Key Accounts; Telephone Sales Order. Word template categories include: Business Forms and Correspondence (Fax Covers, Meeting Materials, Auto Expense Report, Blinded Border Fax Cover, Basic Agenda, Memos); Project Management; Human Resources Forms; Stationery Labels and Cards; Marketing Advertisements; Newsletters; Reports; Family And Home; Calendars. Powerpoint categories include: Earth Views; Education; Finance; Human Resources; Nature; Nouveau; Technology; World Currency; Internet. Publish to PDF: OfficeReady also enables you to create an Adobe compatible PDF file of any Microsoft Word, Excel, PowerPoint & Publisher file. Free Technical Support: Live telephone and email support Monday to Friday, 8am - 6pm. Automatic Profiles: Instead of typing the same information into documents over and over again, the automatic profile feature will insert your name and address into new documents automatically. You can also choose to auto-insert your logo and signature images as well. Photo Editor: With Office Templates built-in photo editor, you can insert images and pictures directly into Word documents from your computer, camera or scanner. The photo editor also allows you to crop, resize, rotate and adjust the image prior to insertion.